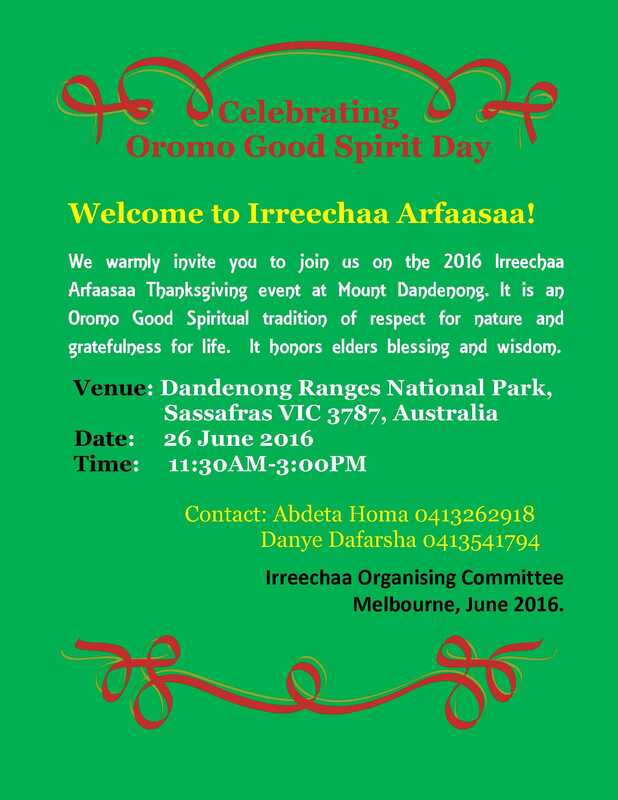 This is warmly invited to join the Oromo community members in Melbourne on celebrating the 2016 Irreechaa Arfaasaa festival at Mount Dandenong. Irreecha Arfaasaa is another annual Oromo Thanksgiving Day that repeats once in May to mark the end of the dry season and beginning of the rainy and planting season. It marks the end of the dry season (October to April) and the beginning of the rainy season for planting (May to September). It is a unique Oromo cultural, historical and natural beautification (planting) in their full glory at the height of the season. On this day, people come to gather on mountain tops to give thanks to the almighty Waaqaa(God) for all the blessings throughout the past dry season and ask for Araaraa(Reconciliation), Nagaa (Peace), Walooma (Harmony) and Finnaa (Holistic Development) for the present and the future. There is also a ceremony of thanking all forebears for their endurance and determination to survive their culture and history – paving the way for further social victory. Irreecha Arfaasaa has been observed by the Oromo people for more than 6400 years. It is an Oromo Good Spirit tradition of respect for nature and gratefulness for life. The ceremony honors elders’ blessings and wisdom, preserves the heritage and assesses the progress of humanity. Come and join this unique Oromo Traditional Good Spirit celebration at Mount Dandenong on 26 June 2016.